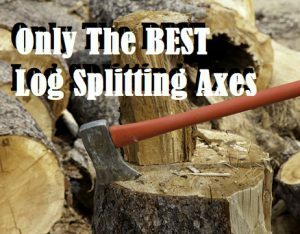 With so much variety and choice for an axe in this day and age, it can be hard to know just what is the best log splitting axe in 2018. With these reviews, I aim to educate the greater community on working smarter, not harder by investing in a lighter and more powerful axe. But why is buying a good axe so hard for the average consumer?. This isn’t an easy question to answer and one of the main reasons that I believe is the simple design of the humble axe. Being such a simple proven design, a lot of companies will take advantage of this fact. They think an axe is just a bit of steel attached to a wooden handle, which is absolutely not the case. So these brands take advantage of the consumers just to have it on the market and make some easy sales. But the sad reality is that many times, they don’t provide a useful tool that is going to make your life a lot easier. This makes it incredible hard to determine just what is the best axe you can get when you need wood split for this coming winter. But ultimately the “best” wood splitting axe becomes a personal choice. As humans, we vary in size, shape and height. So one axe maybe perfect for Bob, but useless for Jill. For example, if you consider yourself shorter than average, a long handled axe may not suit you. But if you’re tall you should forget about using a short handled axe. Especially since splitting wood is already a physical job, the last thing you want to do is make it even more difficult. Some people prefer a nice timber grain or they like a fiber glass handle, neither is worse then the other but it’s a personal preference. What I hope to do on this list is try and cover as many types of choice as possible, then narrow it down to what I consider to be the best wood splitting axes currently out there. For those interested in chopping axes, here you can find my top 5 axes for chopping wood. The Fiskars X27 Super wood splitting axe is the axe that has really stood out to me it sine the time I first laid eyes on it. With it’s razor sharp continuous wedge design I was hooked. Because of this continuous design, the axe isn’t prone to getting stuck in the log, unlike a lot of other axes on the market in 2018. With the way its heads designed to be narrowed makes it perfect for splitting logs that have a straight grain. Which is good as many logs the normal consumer will encounter will have straight grain flowing through them. The problem the narrow head does cause is that if a log doesn’t have a straight grain, it has a tendency to get stuck easier. Which does cause the axe to pull away from you. But thankfully the way Fiskars designed the handle to be more rounded and symmetric. What this does is gives you a good grip so you can pull your hands away quicker if need be. 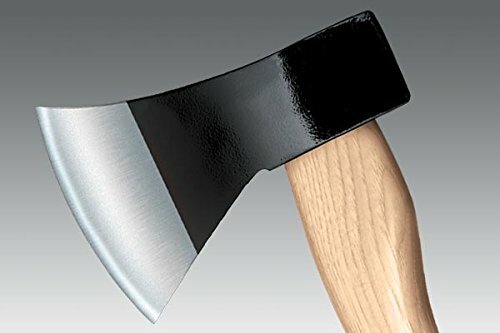 While the version in this axe review is the 36 inch version, it does come in a variety of other sizes so if you don’t like or can’t use a longer axe. Fiskars do have some other smaller versions of this particular axe which I think is just brilliant. But what I like about this particular length is it gives it more weight making it weigh about 6.4 lb. The extra weight makes its swing have a lot more force meaning it splits easier. Being a heavier longer axe there is something that you must consider is that is since it has more power and length, it creates more force so if you can’t handle something like that it might be better to go a shorter or liter option. But, having a lighter wood splitting axe is less physical during the actual swinging motion. So less immediate strain, but more long term strain as you may need to swing a couple times just to crack open the log. 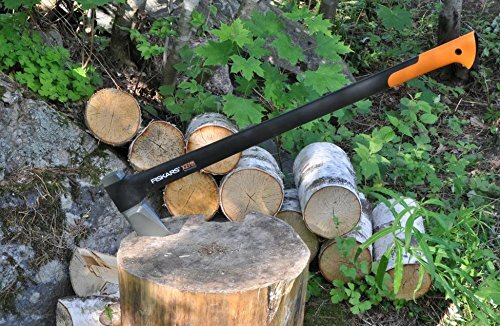 That is why I recommend the Fiskars Axe, it’s a nice weight that can split logs rather easy without needing a gym membership just to lift it. .
Next on this list is the Estwing fireside friend axe. I found this particular version to be very impressive. Once I first saw this axe, I was intrueged to try it out. Fro some reason unknown, it really stood out from the other axes I’ve tried over the years. The first thing you notice about this axe is that it is one solid steel forged log splitting beast. This is something that I really like when you consider just how aggravating it can be if you buy a inferior wooden handled axe. It’s beyond frustrating when you’re out splitting wood and you swing the axe and the head comes flying off. Nothing annoys me more while splitting, so thankfully this axe removes that issue by being one solid piece. One of the main reasons I like this axe and thought it deserved to be on this list is for this one particular reason. That it isn’t just an axe, but also doubles as a maul. Having the one tool that is able to do multiple jobs and exceed at both of them is a very rare and valuable tool, and that’s what this axe does. While it’s made out of steel they decided to design the grip out of rubber so you won’t have any issue holding on while swinging the axe. While this won’t be an issue for a lot of axe users, and more of a warning to beginners who have never really had to use an axe with a rubber handle. After a lot of swings with such a grip it does have a tendency to start tearing up your hands. So always wear a pair of decent gloves no matter what kind of axe you are using. Nobody likes or wants calluses on their hands right?. The grip itself is actually very good to use and very comfortable once you get use to it, one of the better grips I’ve used over the years. Overall, I find the Estwing to be one of the top rated swinging wood axes for 2018. The last on this list is the Trail Boss axe being last doesn’t mean it’s bad, it is actually a very good reliable axe that will last you years if you look after it.Which is one of the main draw cards to this ax. It’s longevity. It just keeps on keeping on. There’s no greater feeling then spending money on a tool you need for it to last for longer than you ever imaged. That is the case I found with the Trail Boss. The first thing you will notice about this axe is just how traditional it looks with its wood grain handle. Nothing beats tradition and this axe screams traditional values. That is, Grandad would love an axe like this for Christmas. It’s old school and the way it should be if you ask Pops. The axe itself is 26 inches in length and made out of American hickory, which if you’ve ever had split hickory yourself you know it’s a really strong hard wood. Making this handle designed and built from quality materials built to last. None of this cheap and nasty woods you see far too often on sale at your local mall. 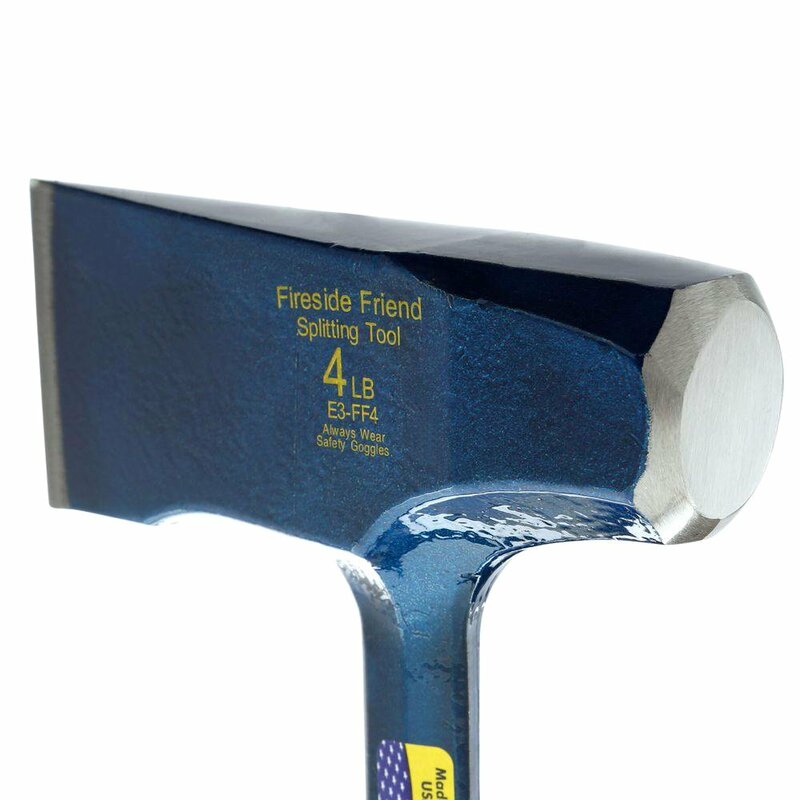 This is a great axe for those on a budget. I find it to be quiet cheap compared to a lot of other axes. But don’t let affordability sway you in the wrong direction. Remember ‘traditional’. While this axe maybe cheaper then what you expect, I found it has outperformed many other axes that cost twice as much.As the saying goes, ‘don’t try and reinvent the wheel’ and this is exactly what Trail Boss is not doing. They are sticking to what works, and what has worked for many many years now. With traditional values out of the way, I still love this axe. It’s a great work horse that works really well as a reliable and sharp tool to have in the shed. It’s also well suited to people who need a great companion for cutting trails, back packing, and bush craft adventures. While it is a great companion for those other things I found it be an exceptional companion for a log splitter. If you are lucky enough to own one of the greatest log splitting inventions of all time ie; a log splitter, then having a reliable and trusty splitting axe like the Trail Boss will be like a match made in heaven. What I like to do is use the more powerful and faster splitter (log splitter) split the large rounds into manageable sizes. Then use this axe to split it down into kindling for getting the fireplace cranking. To me this adds some immense value to this axe and makes it a automatic investment. Anything to make splitting easier is a plus for me. which is why I think the Trail Boss deserves to be in just about every household across America. I never knew there was so much to buying an axe. But I do know when I’m handling one, if it is efficient. Although we are in the UK some of these brands are known to us here. We especially like Fiskars tools and I would probably go for one of these axes if I had to choose. All our Fiskar tools are of the highest quality and as good as new despite having them for a number of years. Being female, I wasn’t sure this article was for me, but I learnt a lot about axes and found this to be a very educational and interesting read. Thanks for the info! Hi Ches, thanks for stopping by. It’s great to see a Women who knows about axe brands like Fiskar. Really impressive. I imagine you and your Husband both like to swing a axe to keep you warn during the chilly UK nights?. The Fiskars X27 looks like quite the axe. As an outdoors man myself, I understand that a quality axe makes all the difference when chopping wood. It is hard to chop wood with a dull axe. You do not want to go cheap when chopping wood, or else you risk injury. I do have a question though. Blades wear down overtime, so what would you recommend I do to sharpen it if need be? I look forward to hearing your answer. Thank you for this article and I hope you have a wonderful day! Hi Alex, great question. The easiest way to explain this is to send you to a video by WrangleStar. It’s a very good axe sharpening video that will get you heading in the right direction. View the video on YouTube here. These axes are freakn awesome!!!! I came across some axes but these are some real game changers!! In country houses there are usually times that people need some reliable wood cutting axes but I’ve never seen one such ase Fiskars X27!! Design is slick and pretty durable. Thanks for introducing me to this amazing product!! No problems Tyler, the Fiskars wood splitting axe is certainly one of the best on the market. I hope you enjoy the smooth fluent swinging action the Fiskars can offer. I really prefer the look and feel of a traditional wooden handle axe. I know these have come a long way, but I remember as a kid the head of the axe would come loose, and I would have to bang the handle on its end to get the head back on. Then I would have to get a new wedge and pound into the top, to keep everything together. How much does the Trail Boss weigh? I know some of the other models are forged, but I really like the look and feel of wood. Thanks for sharing, as always a very informative post. Who can forget the axe head coming loose on the humble axe. Oh the good old days. The Trail Boss axe weighs just 2.7Lbs which is considerably light compared to some of the competitors. This is down to the lightweight wooden handle. If you like the look and feel of wood, then the Trail Boss may e the axe for you. Let me know how you go.